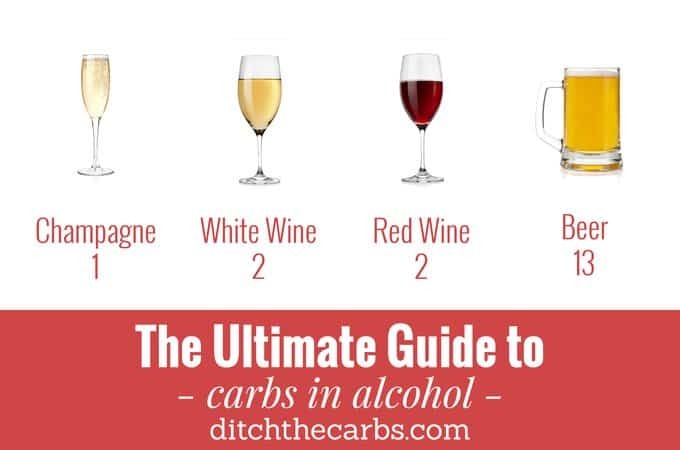 This is my ultimate guide to carbs in alcohol – the good, the bad and the ugly. You can still enjoy alcohol when living low carb, but by making better choices and in moderation. Alcohol can be a tonic or toxic – it depends on how much and how often. One of the most frequent questions I am asked by newcomers who are contemplating living low carb and sugar free, is “can I still drink alcohol?” “How many carbs in alcohol?” For many readers, it is a deal breaker whether they will even contemplate starting. 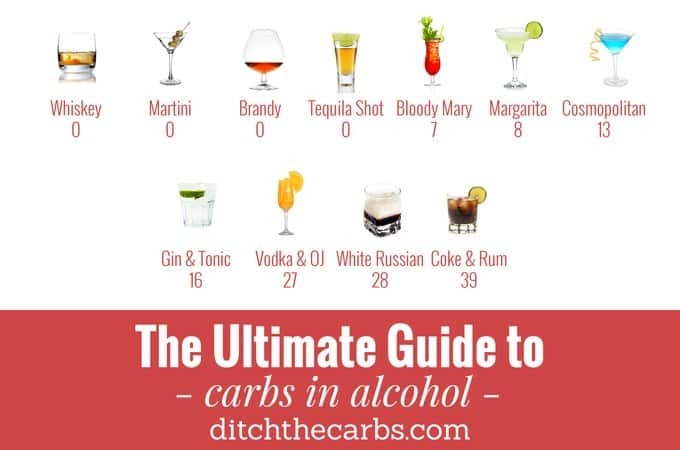 And readers who have been living low carb for some time want to know why their weight has stalled, could it be their Friday night cocktails? Firstly let me say, I love my wine and and I love bubbles. I love a drink with friends as much as the next person, but I know not to drink to excess, and not to drink too often. Occasional drinks with friends and family is a wonderful way to celebrate, relax, unwind and socialise. As long as alcohol is consumed in moderation and you choose low carb options, you can still enjoy alcohol. Do you know how many drinks you have each week? You need to be completely honest with yourself, and if even the thought of cutting back on alcohol is frightening, you need to get serious about how much and how often you drink. I know plenty of people that could not entertain the idea of having a night with friends without excessive alcohol yet they complain they can’t lose weight or have medical problems that are associated with alcohol use. They would never associate the two but make no mistake, excessive alcohol is damaging. It is linked to cancer (especially breast, liver and colon), weight gain, alcoholic liver disease, anaemia and heart disease. Alcohol will always be metabolised before anything else in the liver because it is a toxin. Alcohol is not your friend if you are trying to lose belly fat. You may be able to drink in moderation but make no mistake, it will stop weight loss and even cause weight gain. If you want to breakthrough a weight loss plateau, stop alcohol completely until you see the results you want. Alcohol lowers your self control when it comes to eating healthy foods. Alcohol will increase your cravings and appetite (you get the ‘munchies’). Alcohol can cause fatty liver disease. Alcohol may be good for heart health, but only if consumed in moderation (otherwise it may adversely affect heart health). Red wine can be a great source of reservatrol, an antioxidant. But not in excess. Beer is made from grains (oats, barley, wheat, rye), malt (sugar) and yeast. They don’t call a big gut a “beer belly” for nothing. Beer was originally brewed to provide nourishment for adults and children alike, especially during periods of fasting. So next time you order a beer, ponder for a moment on whether you are actually ordering a liquid meal. 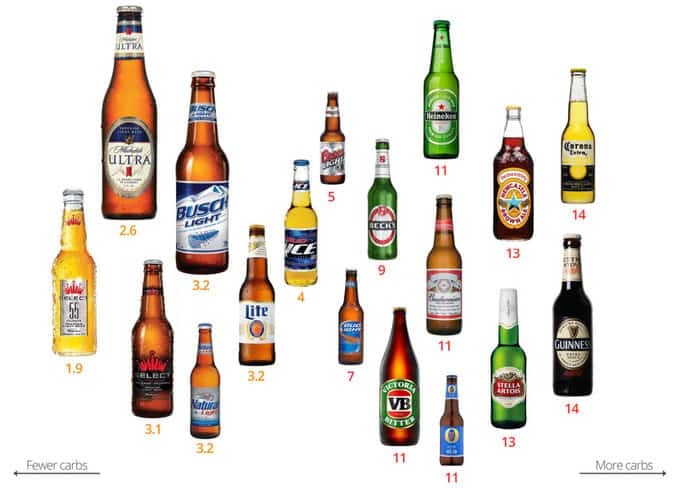 Don’t confuse low carb beer with low alcohol beer. Many perceive them as healthier so consume more of them. Sweet liqueurs, stop buying them – amaretto 17g, Baileys 7.4g, Blue curaçao 7g, Cointreau 7g, Creme de menthe 22g, Jaegermeister 27g, Kailua 15g, Peach Schnapps 8g, Samba 18g. carbs per 1 oz/37ml serving. Spirits can be a great low carb alcohol choice, most are zero carb. What you mix them with can be the problem. Whisky on the rocks is a good low carb option but rum and coke (or even worse, Red Bull) is probably the worst choice you can make. Cocktails can be a total disaster. They are mixed with sugar syrups, high sugar juice or soda, and high sugar liqueurs. Make your own so you know what went into the cocktail, or limit yourself to just one then swap onto a lower carb option. Why not mix your usual spirit with water, diet drinks or soda water? Instead of a single shot in a small tumbler, ask for a single shot in a tall glass so it will last longer through the night. And why not try alternating an alcoholic drink with just the mixer? Avoid the sweet wines and the sticky dessert wines, instead, choose the dry wines and the less sweet varieties. All values were obtained from the USDA database or MyFitnessPal. Vodka has zero carbs as long as you avoid any of the sweet flavored types, Dark rums are a little tricky since the often added molasses or other sweeteners. For example the popular brand Kraken has 1 carb and Captain Morgan has about .5, I would recommend sticking to clear Rum and unflavored vodka if you want to be sure. Question on the Insta-Pot. Is it dangerous like the Pressure Cooker was when it was first introduced? I remember my mother was so scared of using the pressure cooker; and that transferred to me. I heard that the insta-pot is the same thing?? I totally understand your hesitation. I had heard these “exploding pressure cooker” nightmares. To be honest, they were the early pressure cookers and it was when people didn’t release the pressure properly or they didn’t ensure the lid was locked in place. The new Instant Pot solves this as it has a safety release valve. You cannot open the lid without releasing the pressure first. I love mine so much, I have actually started a whole new recipe section for Instant Pot and Slow Cooker recipes. Is it the carbs that come with alcoholic drinks or the alcohol itself that add to belly fat? I want to switch from beer to bourbon on the rocks, to cut carbs and lose weight. After reading this article I am not sure it will matter. Both 🙁 The body will always metabolise alcohol before anything else, so weight loss will stop. Alcohol contributes to alcoholic fatty liver disease. And finally, the carb content of all food and drink is important. Switching from beer (liquid bread) to Bourbon on the rocks is a superb switch. Just keep an eye on quantity, as the article discusses, alcohol affects metabolism, hunger and will power. Hi Libby, this page is great. I just started this LCHF lifestyle and I’m finding your page incredibly helpful. An alcohol – is method cup classic (south africa) sparkling wine allowed? You would have to check whether it is a sweet or dry sparkling wine, that can make all the difference to the carb count. The numbers you give for rum and coke, am I safe to assume that’s full sugar coke? Is it ok with diet coke? Yes that would reduce the carbs significantly! Hi Libby – living in Spain we drink Cava Brut which is made in the same way as champagne but just can’t be called that. Can we assume it is also 1 carb? Brut indicates utmost contain less than 12g sugar per 1000ml, so 1.2g per 100ml. Extra Brut is even less 0-6g per 1000ml). Avoid sec (17-32g) and demi sec (32-60g), they have the most sugar per 1000ml. This is a great little image to see the difference. I was very surprised that the MARGARITA was only listed as 8 Carbs! is listed as 28 grams of Carbs in 4 fluid ounces! and/or used synthetic sweetener you could keep it down to 8 grams. is add a couple ounces of lime or orange flavored seltzer water to the blender. It makes the drink a tad smoother and gives it a little less of that tart-aftertaste bite. It also helps the liquor go further and serve more people! Enjoy champagne, it is one of the lowest on the chart. Where is the info on Champaign? The illustration shows Champaign 1and red and white wine 2. How does that relate to the lists of various red and white wines and the carbs. What an interesting read andgreat infographic. It’s handy to have all details about alcohol summed up in one place. I wish I was a Martini on the rocks girl, but honestly prefer a glass of wine. Therefore, I’ m very pleased to see that my favourite, Sauvignon Blanc, is amongst the low carb booze options! can I use monkfruit instead of stevia? Sure, here is my guide to sweeteners I use.